We want all our clients to feel completely secure when making a claim. That's why Thompsons Solicitors work on a No Win No Fee basis, removing any fear you may have of facing large amounts of legal debt if your claim is unsuccessful. While other firms may say that they offer No Win No Fee claims, they may still saddle their clients with unexpected hidden costs. Here at Thompsons we mean exactly what we say: we have no hidden fees. You can rest assured that we are on your side, and our main concern is achieving the best possible outcome for you and your loved ones, with as little hassle as possible. We can even put you in touch with a range of expert medical professionals to help with your recovery. Thompsons Solicitors in Glasgow can help you whatever the nature of your personal injury claim. Our compensation lawyers have experience dealing with everything from minor injuries caused by trips and falls to more severe head and spinal injuries, as well as industrial diseases. If you're in Glasgow and wish to make a No Win No Fee compensation claim, your claim may be handled by one of the following solicitors, each with a vast amount of experience handling personal injury claims. Click on their profiles to find out more about their specialist area of expertise. Pursuing a No Win No Fee compensation claim in Glasgow with Thompsons Solicitors will help you get the fairest amount of recompense for your pain and loss. For personal injury lawyers who approach each individual case with the utmost care and sensitivity, you needn't look any further than Thompsons. You will be in good hands: we win more than nine out of ten cases we take to court, and our success has been recognised by the industry; we've received numerous awards for our service to the innocent victims of negligence. 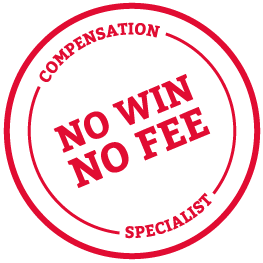 If you live or work in Glasgow and wish to start your No Win No Fee claim today, contact Thompsons on 0800 0891 331 to arrange a free consultation with the expert personal injury lawyer who is right for you.